A couple other thoughts; thank you so much for all your kind thoughts this week when I was sick. I’ve been really swamped with work; sorry I haven’t gotten to your blogs yet. I promise to catch up this season. This entry was posted in Uncategorized on November 3, 2017 by Silver Willow. Thanks for the reminder. I just put it on my planner. On Sunday the time on my clock will be correct and I won't have to do the math. LOL! Glad you are feeling a bit better, SW. So glad you feel better. I was beginning to wonder about the time change so I am glad you gave that reminder. I might change my clocks this afternoon so I don't have to worry about forgetting. 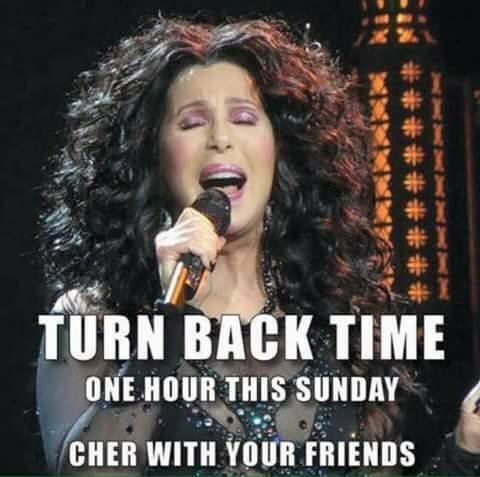 Thanks for this great reminder, love Cher. I never mind the time changes. I like the break up of routine. It was nice that his twitter account was disabled for 11 minutes yesterday. Bless that departing employee for the brief break. Love Cher! What an appropriate word play. It's wonderful that you're feeling better. I'd forgotten completely about the time change. Thanks for the reminder! thanks for the cute reminder!